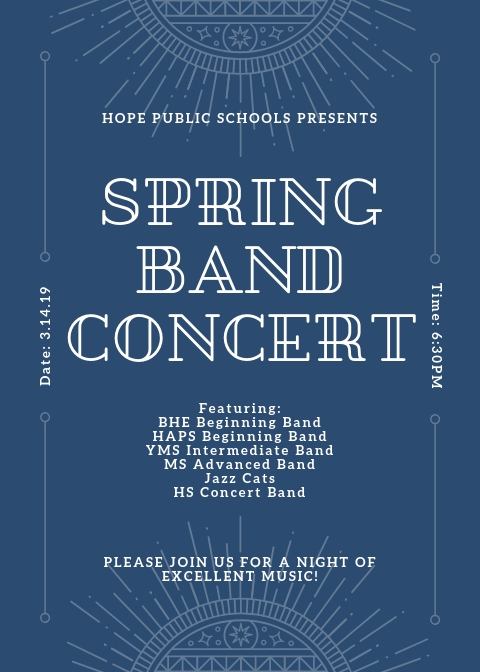 HOPE – The Hope Public Schools Bands Program will present its annual All-Bands Spring Concert at Hempstead Hall on the University of Arkansas-Hope campus Thursday night. Performances begin at 6:30 p.m., and will include all six bands in the concert season program, according HPS Bands Director Julie Gladden. The program will provide a variety of musical styles and highlight student achievement in music including popular pieces such as the theme from the hit movie “Jurassic Park,” the pop piece “Havana,” the timeless “Mickey Mouse March,” a selection from the Shenandoah Suite, and offerings from the Hope High School Jazz Cats. Annual music achievement sectional and band awards will also be announced.